(TBT), was banned in 2008 due to its fouling control methods that offer op- diation of water in a conductivity cell to toxicity to other organisms and the envi- timal protection while maintaining the prevent microbe growth is volumetric ronment. Other non-toxic coatings have integrity of measurements and overall protection while irradiation of a sensor been used to prevent bio? lm, however instrument design. In general, protec- electrode in that cell is considered sur- most of them are not transparent, thus tion can be classi? ed as volumetric, face protection. eliminating their feasibility for biofoul- where the protection is acting in a small The amount of UVC radiation need- ing control in optical sensors. Mechani- volume around the sensor area, or sur- ed to prevent bio? lm in an application cal options, such as wipers, have a high face, where protection is directly acting is referred to as the required UV dose. failure rate, relatively high power con- on the sensing area. For example, irra- The effective UV dose is comprised of sumption, and are ineffective on com- plex surfaces. Other techniques, such as copper or tin plating, have been used to limit and slow organism growth but are not effective in all environments. DNA. By deactivating the microorgan- ism, UV light prevents the formation of a bio? lm, thereby preventing the later phases of biofouling where larger organisms attach to the instrument and render the instrument inoperable. 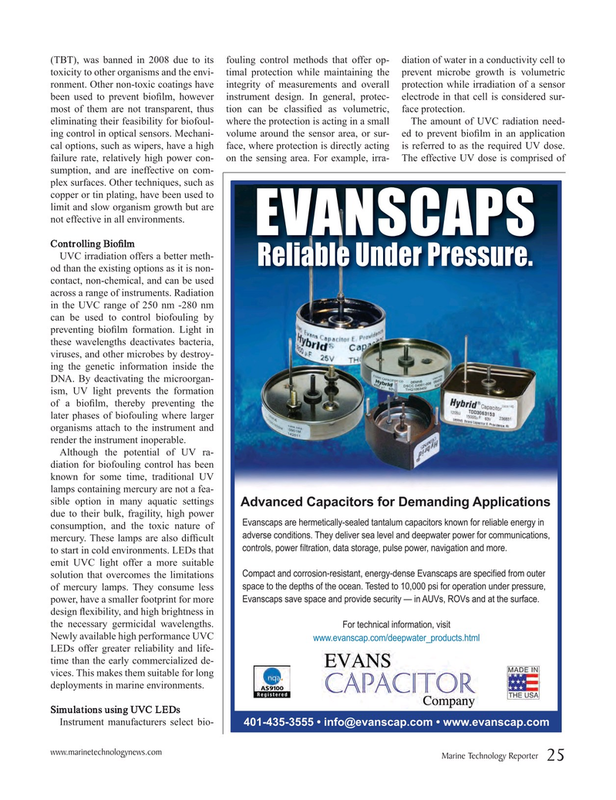 Evanscaps save space and provide security — in AUVs, ROVs and at the surface. power, have a smaller footprint for more design ? exibility, and high brightness in the necessary germicidal wavelengths. LEDs offer greater reliability and life- time than the early commercialized de- vices. This makes them suitable for long deployments in marine environments.